I have this uncanny ability to wake up at unearthly hours without setting any alarm clocks. At 4.30am, I was out of bed. On the balcony outside, was a thermos flask. Bakso Man must have left it there when we were asleep. I tore open the lids of the cup noodles and made breakfast. While the noodles were soaking in the hot water, I woke the little one up. He quickly changed out of his pajamas and pulled on a fleece jacket. After breakfast, we packed all our things and headed off towards Jemplang. With a backpack, he struggled up the road. Glimpses of Semeru perked him up a bit, but he looked a bit disappointed when I rejected a horseman’s offer. His steps were slow and laboured. He was inching forward at a snail’s pace. The sun was soon up. We missed sunrise over the caldera. I grabbed his backpack from him and hoped that he would catch up. He remained far behind me. Sunlight had already flooded the entire caldera floor when we arrived at Jemplang. He rushed into the ranger’s office and sat down. I paid the national park entrance fees. One of the more senior officers remarked that the kids today are no longer the kids we were. Sunblock applied, we headed off to a very bumpy concrete path leading to the caldera floor. A little detour to the left brought us onto the savannah. It was a vast expense of greenery thanks to the thick and tough grasses that carpeted the rolling ground. We gasped. This was really teletubby land. My original plan was to do a crossover to Bromo from here. Everyone I asked unanimously agreed that it was impossible to cross the savannah into Mt Bromo. I wasn’t convinced, but to prove them wrong would mean that I’d have to climb up the steep slope, bashing through the thick vegetation. There was no way the little one was going to make it. I aborted my ambitious plan and proceeded to trek anti-clockwise on the caldera floor. The little one was not used to this kind of walking, but the stunning landscape piqued his interest and determination – for a while. Hunger, thirst and fatigue – things which are quite unfamiliar to him in Singapore, soon set in. He didn’t complain that much, but he was trailing further and further behind. The minutes turned to hours. The sun rose higher and so did the mercury. A cold 10-degree morning became warm and sweltering. What’s worse, jeeps churned clouds of fine ash. He was struggling and suffering in silence. I stopped to wait for him, telling him to endure. Cemara Lawang was already in view. The tough but thinning grasses finally gave way to a barren sand sea. The broken oyster shell of Mt Bromo gradually came into view. While the sand sea was flat for most parts, dunes appeared near Bromo itself. The little one was excited for a while. Our destination seemed like it was just a stone’s throw away. Then, it was the long, uphill climb from the sand sea to Cemara Lawang. He was definitely in his last legs. I grabbed his backpack and trotted up the road littered with horse poo. Indonesians hanging around the viewpoint at the top laughed as he moaned and groaned. To reward him for the huge effort, I decided to stay in a nice hotel. We left our bags at the counter as it wasn’t check in time yet. Then, we’re off fill our empty tanks. A nearby warung provided a very tasty nasi rawon for me and a mee goreng for him. Compared to 20 years ago, the warungs nowadays pay a lot more attention to hygiene. The language also became a lot more “English”. They don’t call bill “bon” or “rekening” anymore. Toilet is now “toilet” and not WC. However, one thing that didn’t change, was the Indonesian’s tolerance for unfiltered coffee. After some serious refuelling and rehydration, we headed back to the hotel for a much needed hot shower. Caked in black sand, our boots and clothes also needed a good wash. We spent the rest of the afternoon hanging out at the viewpoint just outside the hotel. As the day wore on, the clouds had moved in, but the view was still pretty awesome. As it got cloudier and colder, we went back into the restaurant of the hotel to make use of the wifi. At this moment, a Singaporean family checked in. You could tell they were Singaporeans from their accent. You could also tell from the way they complained about having to pay for extra beds to be added in they “cottage” they booked. So embarrassingly Singaporean. Anyway, I booked my jeep transport to Penanjakan for next morning. It was expensive for just the two of us and I was anticipating a horrendous crowd on a Saturday morning, but I felt that the little one should see it at least once in his lifetime. We then had an early dinner at the hotel restaurant. Contrary to the advice from the Lonely Planet, the food was excellent, albeit a pricey. We retired at 8.00pm, expecting a wake up call at 3.00am the next morning. The little one had no trouble falling asleep as he was exhausted. At about midnight, there was a huge commotion that woke me up. A bunch of drunk Americans had just checked in and were making so much noise that it was virtually impossible to sleep. Looks like Singaporeans were not the only ugly ones around. At 3.00am sharp, there was a knock on the door. I woke the little one up and we stepped out into a spray of cold mist. This was the first time I was experiencing this at Bromo. The humidity must have hit a high, coinciding with a temperature that must have fallen below dew point. I was disappointed. How could we see anything in all this mist. The little one wanted an extra jacket which I had already prepared. We soon found our jeep. It used to be a chaotic mess. This time, I saw my name nicely printed in huge font on an A4 paper stuck on a yellow jeep. Things have certainly improved in this area. The jeep descended from Cemara Lawang and took a plunge into a sea of clouds. Submerged in the milky contents of the caldera, we could only hope that the driver knew his way. The jeep went confidently out into the sand sea, then proceeded to turn anti-clockwise around Mt Batok. It then began to ascend on a road on the western side of the caldera wall. This part of the wall is much higher than Cemara Lawang. The driver assured me that we would soon be above the clouds and the view would be clear from the top. We arrived early. The warungs near the viewpoint were all packed with sleepy visitors enjoying their tea, coffee and pisang goreng. We sat down for some hot tea and walked up to the viewpoint only when there was a glimmer of light in the sky. The crowd was unbelievable. Everyone was so kiasu to make his trip worthwhile. They were standing on seats and climbing up railings. Everyone behind the first row was blocked. Selfie sticks kept waving in the air in an attempt to get above the heads. Having seen sunrise so many times, this one was comparatively unspectacular for me. I pointed out the island of Bali to the little one. He wanted to see Semeru, but the railing was encrusted with human barnacles which were determined to fill up the memory cards on their phones. We had to wait nearly an hour before we had a chance on the railing. Soon, we too became human barnacles, reluctant to give up our hard-earned place. For the little one, the view must have been truly awesome with clouds like a layer of cream over the caldera, the flutes on Batok and the caldera walls and Semeru 3676m, highest mountain in Java, towering above everything else. We walked back to our jeep in broad daylight, but the search for the jeep was made difficult by the sheer numbers of them. 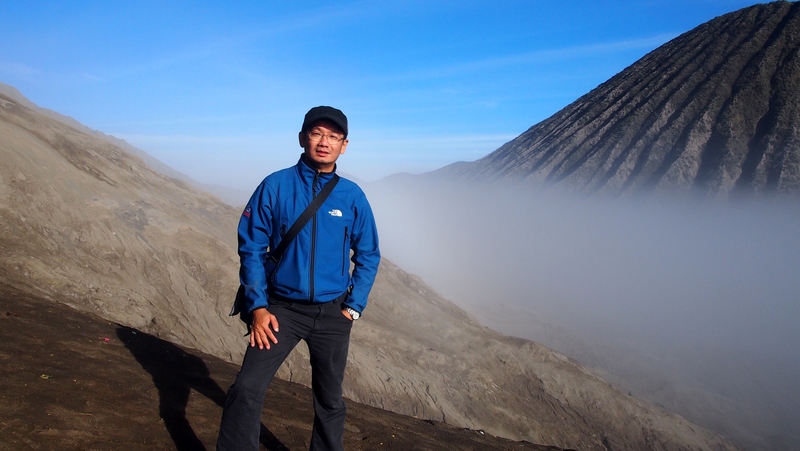 We descended the caldera wall into the sand sea, drove in a clockwise direction and ended up in front of Mt Bromo. With so many vehicles, at Bromo, the horsemen should have died out, but the jeeps very considerately stopped some 2km from Mr Bromo. They formed a neat row with the northern caldera wall in the background. We were besieged by horsemen the moment we alighted from the jeep. Some of them had even learned to speak Mandarin! My first instinct was to reject them. These folks were obviously in cahoots with the jeep drivers to get the most out of us. But then, with so many jeeps at Mt Bromo these days, one would expect the horse-riding to trot into history in any developed economy. Their embrace of new technology notwithstanding, the Tenggerese seemed to have reached a compromise which allowed them to preserve their tradition as horsemen. On second thought, I realised that these folks deserved my respect, but I had a lot of photo opportunities there and then. It would have been difficult to take pictures on horseback. The ground became somewhat undulating when we reached the foot of Bromo. The 2km walk from jeep line to the foot of Bromo was literally a walk in the park. Ironically, it’s the last part up a steep slope and the staircase where most people need help. The horses can’t get you there, so no matter what, you’ve still got to walk. The little one climbed up the stairs and reached the top without stopping. It’s just a bit like the jungle fall path at Bukit Timah – hardly a challenge, but there were obviously many unfit people that day. A monk stood at the edge of the crater, looking pensively at the sea of clouds filling up the Tengger caldera. The moment we reached the top, the little one panted heavily and complained about the smell from the crater. I wasn’t sure if it was the eerie atmosphere or the lack of railings on the outer slope of the crater, but he was frightened and he wanted to get down fast. Strangely, as he was descending, he saw some Indonesian and ang moh youths climbing up the sandy slopes without using the staircase and said that he wanted to do that the next time he comes to Mt Bromo. On our way back to the jeep line, we encountered another kind of smell. The aroma of grilling meat. The folks at NEA would go crazy if they ever saw a satay (spelled sate in Indonesian) stall at the foot of Mt Bromo. The little one was amused and eager to try, but having no confidence in the freshness of the meat, I decided to give the Bromo sate a miss. After a good breakfast at the hotel, we washed up, packed our bags, checked out of the hotel and looked for a bus to Probolinggo. We caught a bus to Malang from there and went back to Surabaya the next day. Even though my initial plan to traverse the savannah didn’t materialise, I was happy that the little one learned a lot on this trip. We’ll be back.